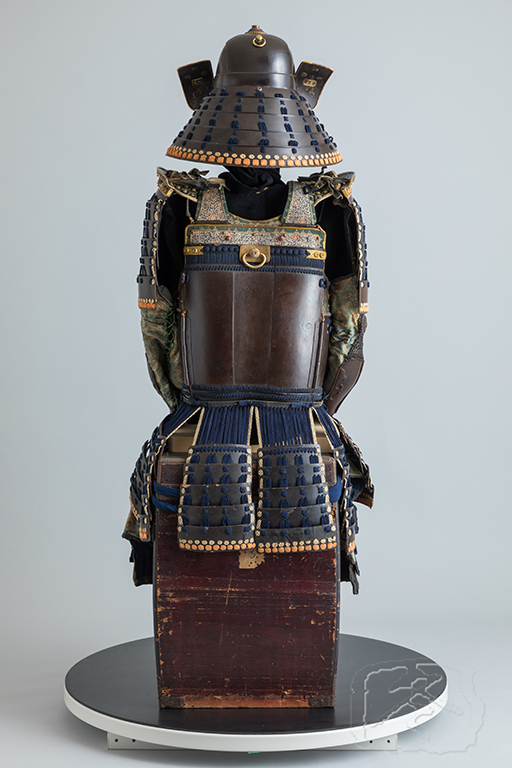 This armour is composed of an unusual lacquered ‘zunari kabuto’ (simple shaped helmet of three plates). The ‘tehen kanagu’ (fitting surrounding the hole at the top of the bowl) is made of five lames of soft mixed metals. 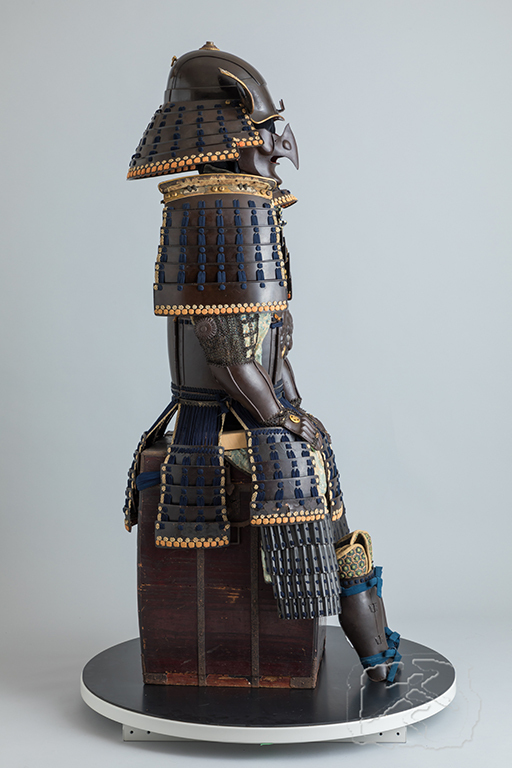 The ‘fukigaeshi’ (turn backs) and ‘mabisashi’ (peak) are trimmed with gilded copper. The ‘fukigaeshi’ are wrapped with stenciled doe skin and bear the crossed hawk feather heraldry of the Asano clan of Akino kuni, Hiroshima han. 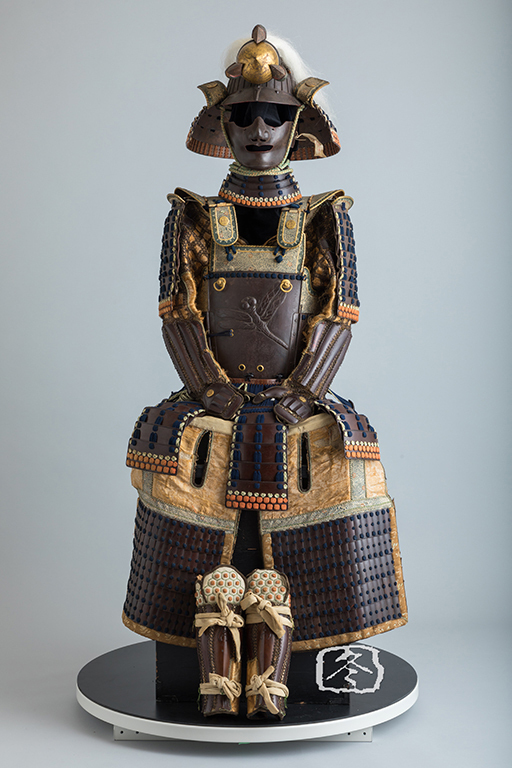 The ‘manju shikoro’ (rounded neck guard) is made of five lames of black lacquered iron plate. 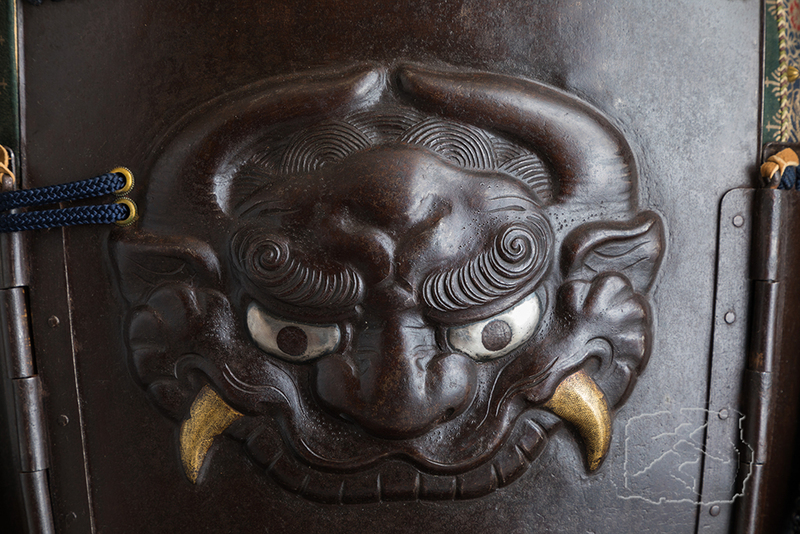 The russet iron ‘tengu men’ (mask in the form of a mythical bird famed for its skill at swordsmanship) is signed MUNEYOSHI and has a fine patina. The interior is lacquered red. The ‘tare’ (throat guard) is made of three lames of lacquered iron plate. The five plate russet iron cuirasse is mounted with finely scrolled gilded copper trim. 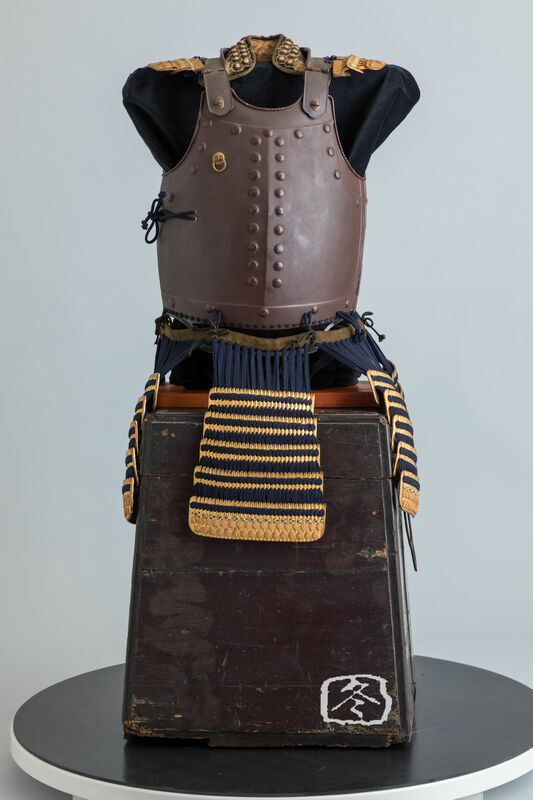 The ‘muna-ita’ (top of breast plate), ‘waki-ita’ (under arm plates) and ‘seno-ita’ (top of back plate) are wrapped with stenciled doe skin. 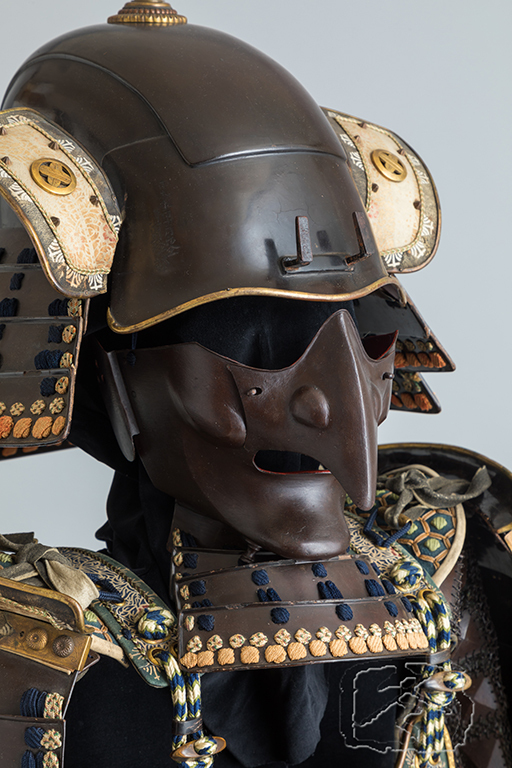 The breast plate is decorated with an imposing embossed face of a demon, with eyes of silver and ‘shakudo’ and the fangs gilded with gold. 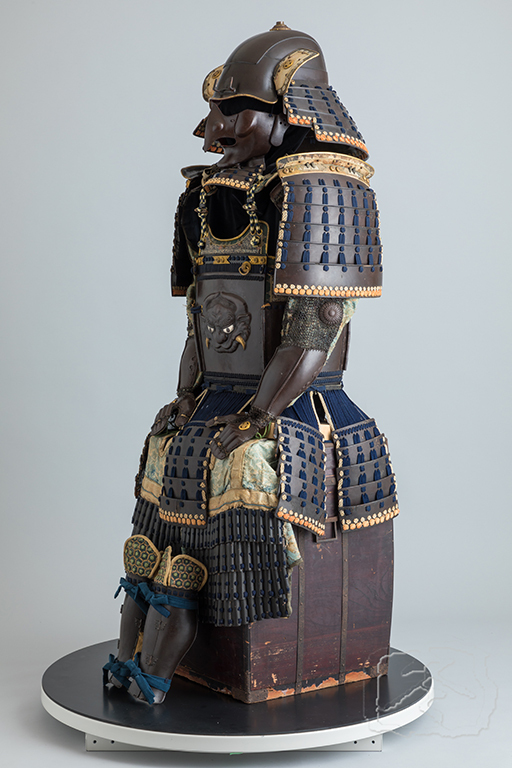 The ‘kusazuri’ (skirt is made of seven divisions each of five lames of lacquered ‘nerikawa’ (molded leather). 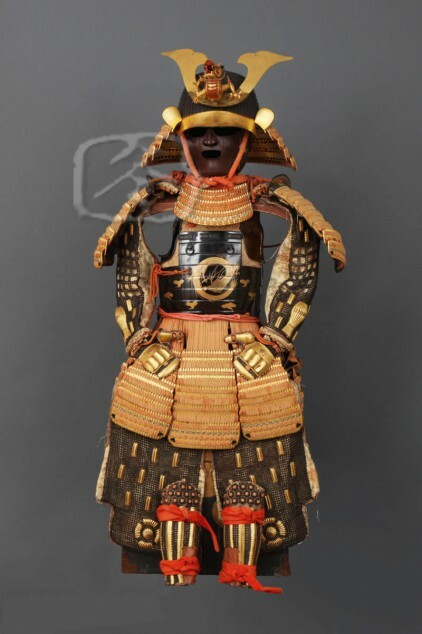 The ‘sode’ (shoulder guards) are each made of six lames of lacquered iron plate. The russet iron ‘tsutsu gote’ (sleeves of tubular form) are signed MYOCHIN MUNEKANE. 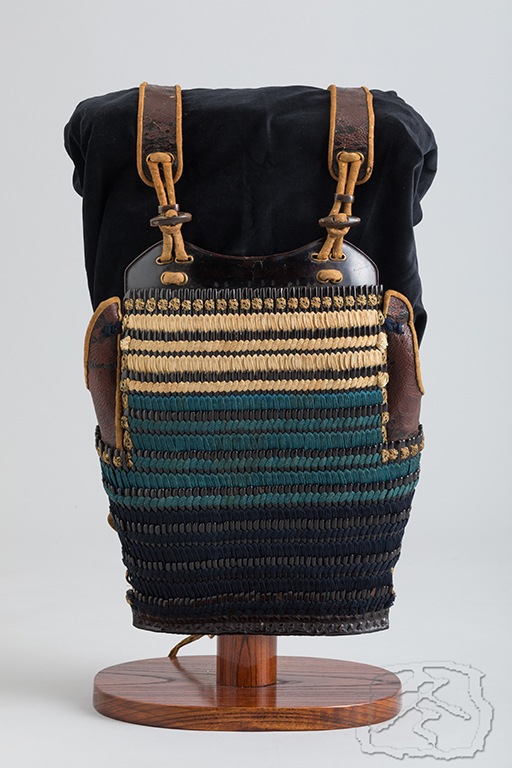 The back of the ‘kou’ (hands) are decorated with more Asano clan heraldry. 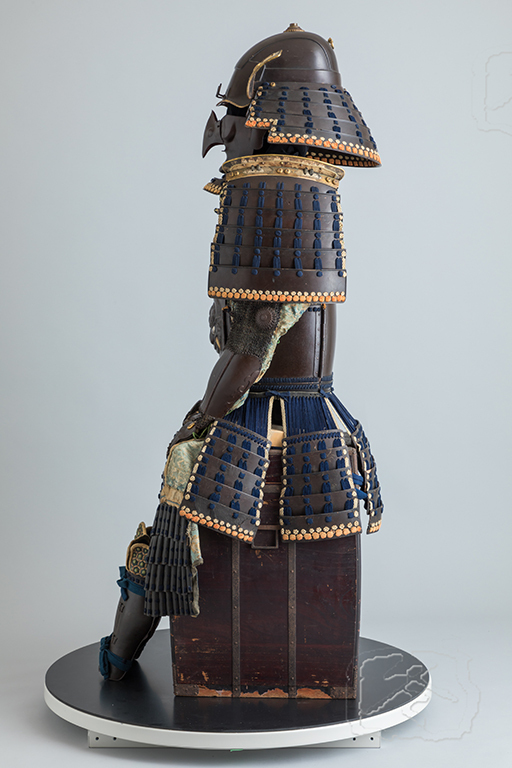 The ‘haidate’ (thigh guards) are made of over lapping lacquered iron plate of ‘kawara’ (roof tile design). 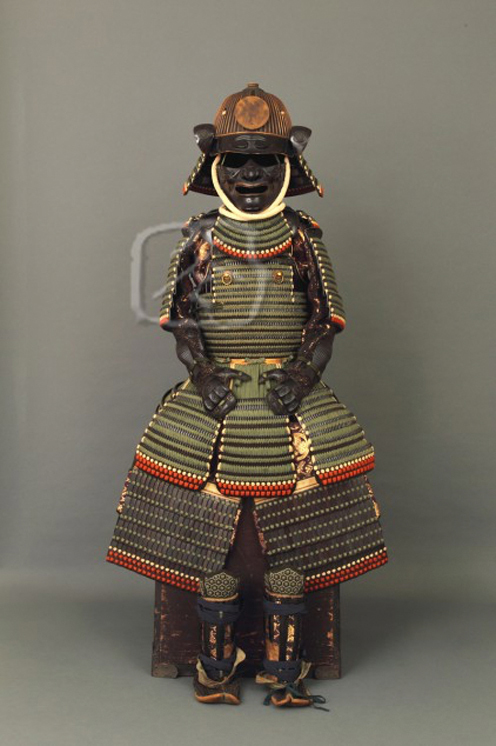 The russet iron ‘tsutsu suneate’ (shin guards of tubular style) have green ‘kikko tateage’ (tops) matching that of the ‘kohire’ of the cuirasse. 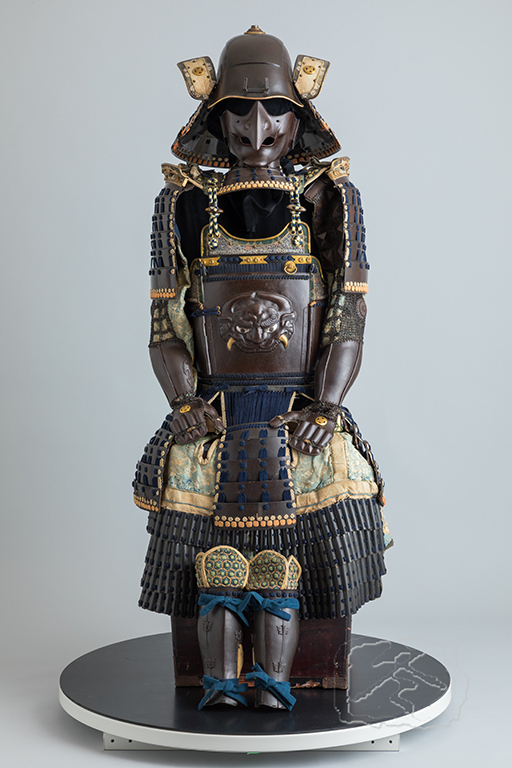 This armour is stored in a paulownia wood box.